It should come as no surprise to learn that there may be an element of political gamesmanship behind the ethics attacks on Secretary of State Scott Gessler, but campaign finance filings show a link between many of those on the Independent Ethics Commission and Gessler’s current 2014 Democrat opponent, Ken Gordon, or his previous opponent Bernie Buescher. Three of the five commissioners give exclusively or primarily to Democratic causes, as does the executive director of the IEC and Luis Toro, executive director of Colorado Ethics Watch, who filed an ethics complaint. 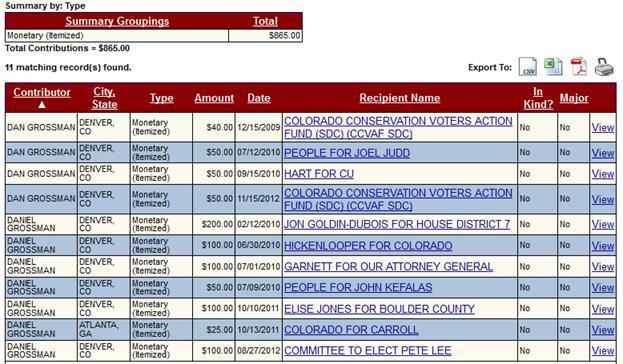 Here are a few of the folks involved worth highlighting for their highly-partisan political giving. 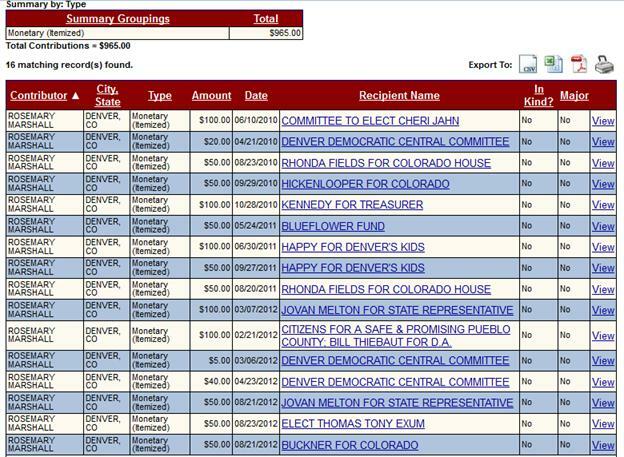 Newly-appointed commissioner and former Colorado State Representative Rosemary Marshall financially supported Bernie Buescher’s campaign against Gessler in 2010 and donated to Buescher’s state house race. Additionally (and separately), she’s given nearly $1,000 to Democrat candidates and causes over the past few years. Chairman of the IEC, Dan Grossman has contributed $865 exclusively to liberal causes and candidates. 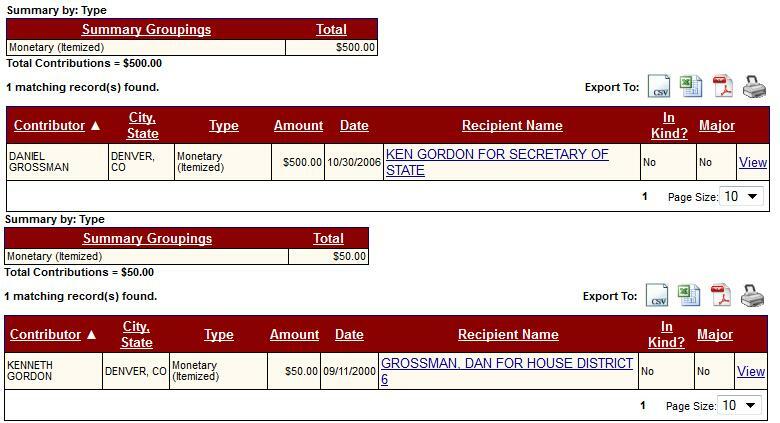 Grossman also donated $500 to the 2006 SOS campaign of Ken Gordon, who is now Gessler’s 2014 Democrat opponent. Reciprocally, Ken Gordon contributed to Grossman’s campaign for state house. 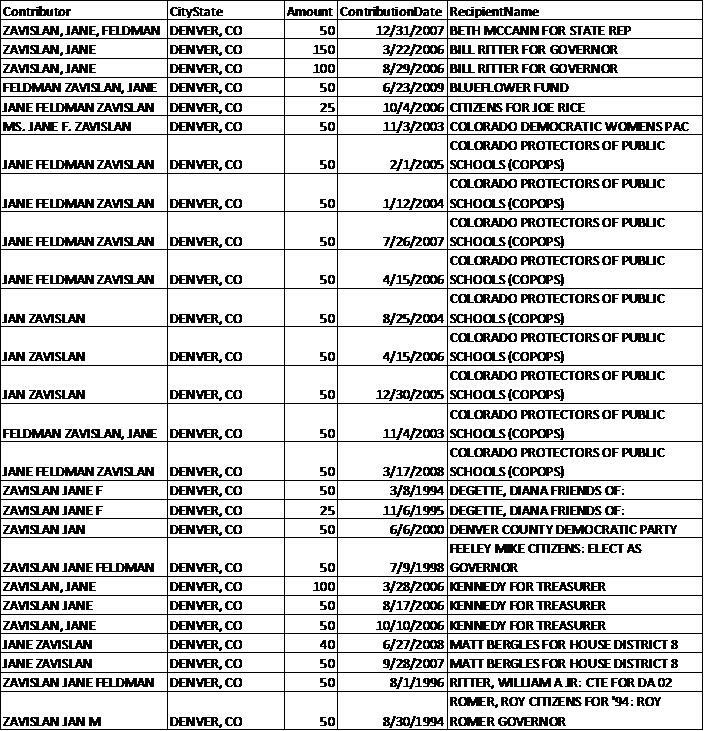 Bill (or William) Pinkham, the mayor of Estes Park, another commissioner with the IEC, also has primarily contributed to Democrat candidates. Steve Johnson’s race was considered to be nonpartisan, but has served as a Republican in the State House. In the spirit of full disclosure, IEC’s Sally Hopper and Matt Smith were Republican candidates and legislators and also have only given to Republican causes, but now we’re at three Democrats (two of which have contributed to Gessler’s past or present Democrat opponent) and two Republicans. But, there are more players to consider. Even the Executive Director of the IEC, Jane Feldman, has only contributed to Democrat candidates and causes and the Democrat party, revealing her partisan agenda. Feldman gave $450 to liberal causes and candidates over the past two years or so, but under her married name Zavislan, she’s given $1440 to only liberal candidates and causes over the past 20 years or so. Then, there is Luis Toro, executive director of Colorado Ethics Watch, who is bringing forth the complaint against Gessler. He also contributed $50 to Ken Gordon for Secretary of State in 2006, as well as a host of other liberal candidates and causes. Perhaps the makeup of this Commission can be filed under “elections have consequences”, but it might be a better idea to not have highly partisan (of either party) commissioners serving on the Independent Ethics Commission. The inclusion of such commissioners only invites the question – just how independent is the Independent Ethics Commission? Ensuring an accurate vote is a problem for you? Gessler only wants to be sure the integrity of an election is maintained. I don't want my vote negated by a vote from someone who shouldn't have voted in the first place. This is basic. I applaud his efforts. This ethics investigation is bogus. Gessler shouldn't have to waste his time on it. This "investigation" is politically motivated. if this sort of bullying were to take place in a school, the teachers would be all agitated. Bullying is bullying. It is now so common for hard-left progressives to simply focus of character assassination (instead of the merits) that it is no longer even surprising. And how much of the taxpayer's money has Gessler spent on lawyers? After what he's tried to do to voter rights in Colorado, I'm happy that he's feeling a little uncomfortable.